Technology is a big part of healthcare. In a 2014 McKinsey survey, more than 75% of patients polled said that they would like to use digital healthcare services, as long as those services meet their needs and provide the level of quality they expect. And yet the healthcare industry lags behind every other sector when it comes to implementing technology. HIPAA Journal writes, "In some cases, the new technology now being introduced by healthcare providers was first introduced in other industry sectors many years ago." A break in that trend has come from the surge of wearable devices. Getting beyond counting strides and counting calories, the healthcare industry has seen tremendous growth in wearable and wireless technologies that can monitor serious diseases. Reuters reports a shift from research to commercialization of wearable computing devices that detect and monitor advanced conditions, "potentially transforming the treatment of conditions ranging from epilepsy to diabetes and creating business opportunities estimated to be worth tens of billions of dollars." From $2 billion in 2014 to more than $41 billion in 2020, according to Soreon Research. Big companies know this, and they're pivoting to get involved. Just recently, Teva Pharmaceutical Industries announced a partnership with Intel to develop a wearable device to monitor patients with Huntington's disease, a fatal degenerative condition. The end goal for many of these healthcare technology proponents is the application of artificial intelligence. Artificial intelligence (A.I.) is what enables a digital device to recognize and understand objects, speech and data. Artificial intelligence offers promise for healthcare. As CIO.com columnist Greg Freiherr wrote: "The solution prescribed to combat inefficiency [in healthcare] is to get rid of as many people as possible... A.I. is a natural for that." Still, some people are scared of A.I. in healthcare. They predict tomorrow's A.I.-infused hospitals will have factory-like wings, tended by technical specialists and an array of robots. "Artificial intelligence in healthcare is not about the robots," says Dr. Anthony Chang, in a recent talk on A.I. A pediatric cardiologist and chief intelligence and innovation officer at Children's Hospital of Orange County, Chang says, "Machines are learning in the same way a baby's mind is learning... at an exponential rate." "Robots won't steal doctors' jobs," predicts Frost & Sullivan analyst Venkat Rajan. "But they will spare overworked docs some of the dangerous fatigue that can lead to mistakes." Putting aside the people vs. computers debate, A.I. is capable of making us more precise. Artificial intelligence could, for example, speed up brain scans and enable the systems to deliver more detailed information about the condition of tumors. That's the potential power of big data and artificial intelligence in medicine. This technology is particularly valuable in the treatment of rare diseases, where population sizes are small. To truly accelerate treatments and cures, these conditions require intelligence-based medicine, rather than evidence-based medicine. "The industry needs game-changers," Nicole Boice, founder and CEO of Global Genes told me at the Rare Patient Advocacy Summit, Sept. 24-25 in Huntington Beach, Calif. Perhaps it was premonition — a week later, rare disease research and development company Castle Creek Pharmaceuticals raised $48 million in its first of institutional funding. 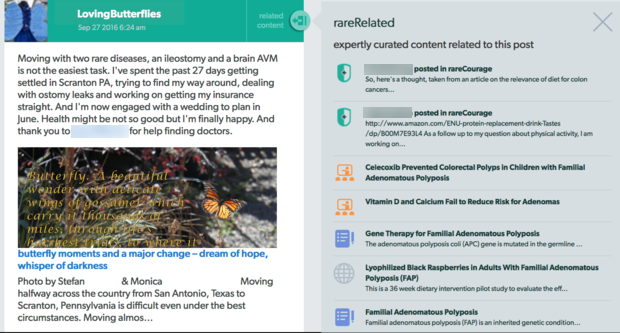 Unlike traditional healthcare, the rare disease community is one to embrace new technology: 90% of rare disease advocacy groups have a presence on Facebook. "Rare disease communities seek and adopt new technologies out of necessity," says T Anthony Howell, co-founder of the award-winning custom-community building solution, OneVoice. "The rare disease patient, friends and families all need vetted information about their disease. [They need] to meet people like them and to engage in clinical research. So they embrace new technologies like social media and machine-learning-generated content communities." So what's possible for A.I. and this early adopter group? What if we could have a computer program that would sift through data to identify patients with rare diseases and get better at finding a diagnosis every time? Then what if that same program could develop a model for a rare disease based on genetic sequencing data without any other understanding of the disease? Artificial intelligence will allow clinicians to compare an individual patient's characteristics — down to the last nucleotide in his or her genome — against billions of anonymous, patient histories and studies in global medical research. No longer, then, will the development of treatments rely on expensive and elaborate clinical trials. Clearly, the age of aggregation has washed the tsunami of information over our shores, and now people need information curated by experts into manageable chunks. This is particularly relevant in medical information where the Centers for Medicare and Medicaid Services and the federal government have unleashed petabytes if not exabytes of public health data. The challenge in this space is big data — not having enough of it, but being able to process and learn from it. "We're only using 10% of our available data," says Spyro Mousses, executive scientific adviser at Children's Hospital of Orange County. "And that data is doubling every 18 months." Healthcare needs A.I. to handle that data. The future role of artificial intelligence in healthcare is all about democratizing its availability, where the limitations of time and space in conventional medicine are replaced by an always-on, always-ready solution. But it can only do this if it improves outcomes, pleases patients and lowers costs. It may look like some of the aforementioned predictions. It may not. Perhaps the biggest question is one Chang asks: "In the IoT of medicine, are doctors prescribing apps, or are apps prescribing doctors?" In neither case does it mean these machines will look like Mr. Roboto.